Home / Reviews / Two Rivers Mega Coffee Sampler! Two Rivers Mega Coffee Sampler! One of the reasons that I was so excited about getting a single serve coffee maker was the ability to have the options of having any kind of coffee or any other kind of drink without wasting a whole pot. Now with the Mega Sampler from Two Rivers coffee, I get to have a new kind of coffee every day. Two Rivers coffee is always premium coffee with 100 percent Arabica beans that are expertly roasted and they also have an advanced filter system so your coffee tastes fabulous. These coffee cups are compatible with original brewers, however they are not compatible with the new 2.0 brewers. 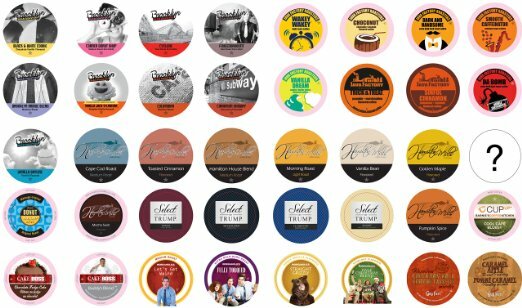 Some of the cups in the Mega Sampler box include Brooklyn Bean Roaster, Java Factory, Trump, Guy Fiery just to name a few. There are dark, medium and light roast, extra bold, flavored, unflavored and even decaf, when they say variety box they really mean that! I really like to have a different coffees and drinks around as I often have visitors that like different things, it is nice to have them around when I need them. Two Rivers coffee manufactures over a hundred different coffees and the sampler packs are the perfect way to find your best cup, even if it changes daily. One of the best things about this box is that every cup that I have had has been amazing, and the flavors bold and true to life, too many times I have tried coffee named maple and it just tastes like artificial syrup, the maple sleigh flavor in this box tastes exactly like real maple syrup. If you are like me and love all kinds of coffee this is the best way to go, you can easily try anything you want and to offer your guests a superb cup of coffee of their liking. You can order the Mega Sampler here on Amazon and I am sure this is one pack you are going to want around during the holidays. Previous post: What do we do with all of that CANDY?! Next post: Best Stain Remover Ever by VeryDirtyCarpets!